The group photo above shows three couples. 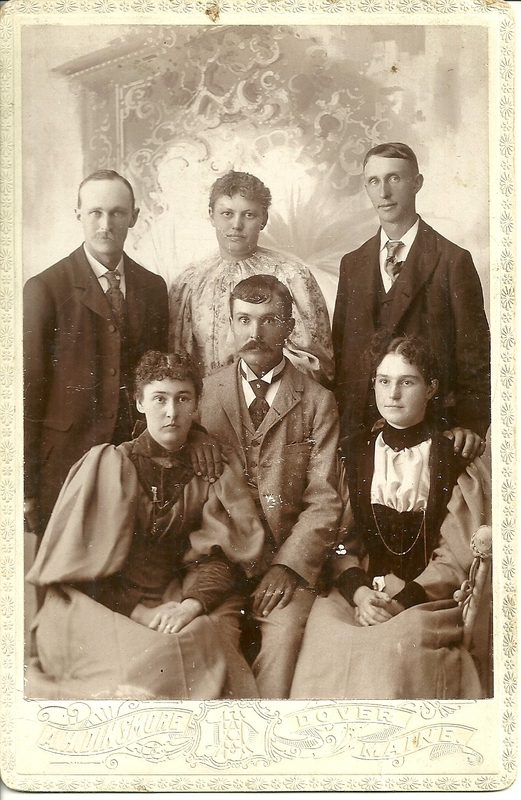 The people standing and sitting at right are Alton Chadbourn and his wife Ida (Gray) Chadbourn. They were photographed with friends John Lee Collins and wife Fannie Emmie (Mitchell) Collins and Ephraim Sinclair and wife Ethel (Stafford) Sinclair. The photograph was taken at Dover, Maine, by the A. H. Dinsmore studio. The couples lived in the Harmony, Maine area. Alton Chadbourn was born 20 December 1872 at Harmony, Maine, in Somerset County, the son of Lorin and Vesta A. (Stafford) Chadbourn. His paternal grandparents were Isaiah and Irene Dearborn (Leighton) Chadbourn. His maternal grandparents were John M. and Mersoe or Minerva S. (Littlefield) Stafford. 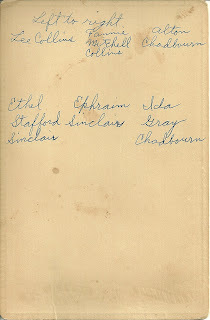 On 22 December 1895 at Wellington, Maine, Alton Chadbourn married Ida M. Gray. She was born 2 June 1878 at Harmony, Maine, the daughter of Andrew and Ella (Davis) Gray. Her paternal grandparents were Abraham or Abram and Mary (Smith) Gray. I don't yet have the names of Ella Davis' parents. 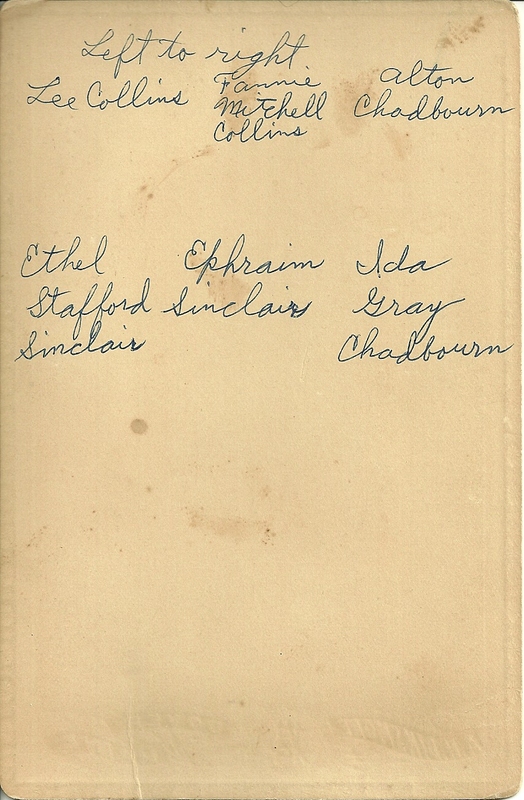 Alton and Ida Chadbourn raised a family of at least four children in Harmony, Maine. For more information, see the page at the Maine and Maritime Canada network for Alton Chadbourn and Fannie Emmie (Mitchell) Collins. An earlier post discussed John Lee Collins and Fannie Emmie (Mitchell) Collins.